NASA's asteroid sample return spacecraft flew past Earth on Friday on its way to asteroid Bennu, for a rendezvous next August. The OSIRIS-REx (Origins, Spectral Interpretation, Resource Identification, and Security - Regolith Explorer) spacecraft came within 17,237 km of Antarctica at 12.52 pm EDT (10.22 pm India time) on Friday, just south of Cape Horn, Chile, before following a route north over the Pacific Ocean, NASA said. 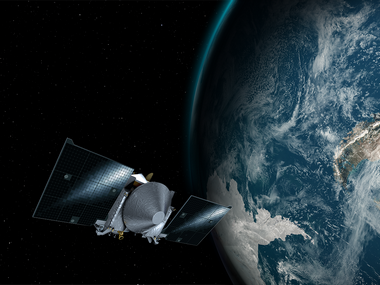 "The encounter with Earth is fundamental to our rendezvous with Bennu," said Rich Burns, OSIRIS-REx Project Manager at NASA's Goddard Space Flight Center in Greenbelt, Maryland. The spacecraft launched on September 8, 2016, on an Atlas V 411 rocket. Although the rocket provided the spacecraft with the all the momentum required to propel it forward to Bennu, OSIRIS-REx needed an extra boost from the Earth's gravity to change its orbital plane. Bennu's orbit around the Sun is tilted six degrees from Earth's orbit, and this manoeuvre changed the spacecraft's direction to put it on the path toward Bennu. As a result of the flyby, the velocity change to the spacecraft was 3.778 kilometres per second, NASA said. "The total velocity change from Earth's gravity far exceeds the total fuel load of the OSIRIS-REx propulsion system, so we are really leveraging our Earth flyby to make a massive change to the OSIRIS-REx trajectory, specifically changing the tilt of the orbit to match Bennu," Burns said. The mission team also is using OSIRIS-REx's Earth flyby as an opportunity to test and calibrate the spacecraft's instrument suite. Approximately four hours after the point of closest approach, and on three subsequent days over the next two weeks, the spacecraft's instruments will be turned on to scan Earth and the Moon, NASA said. These data will be used to calibrate the spacecraft's science instruments in preparation for OSIRIS-REx's arrival at Bennu in late 2018. "The opportunity to collect science data over the next two weeks provides the OSIRIS-REx mission team with an excellent opportunity to practice for operations at Bennu," said Dante Lauretta, OSIRIS-REx Principal Investigator at the University of Arizona, Tucson. "During the Earth flyby, the science and operations teams are co-located, performing daily activities together as they will during the asteroid encounter," Lauretta added.